Cyclone Well Drilling - Water Well Drilling and related services serving Carteret, Craven, Jones, Onslow and Pamlico Counties. 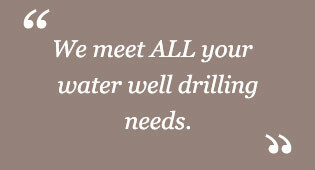 Cyclone Well Drilling provides water well drilling services for both domestic and commercial purposes to ensure that you have a good water supply. 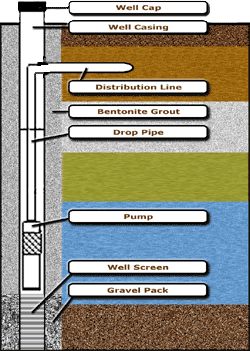 Deep well work includes 2-inch, 4-inch and 6-inch systems. A drilled well consists of a hole bored into the ground and lined with casing. Unlike other well companies, we at Cyclone Well Drilling, set casing for the entire depth of the well which lasts longer and is structurally superior. The casing (usually a metal or plastic pipe) prevents the collapse of the borehole walls and (with a sealant such as cement grout or bentonite clay) prevents surface or subsurface contaminants from entering the water supply. The casing also provides a housing for a pumping mechanism and for the pipe that moves water from the pump to the surface. Submersible pumps, located near the bottom of the well, are most commonly used in drilled wells. Wells with a shallow water table may feature a jet pump located inside the home. Once the well is completed, it is bailed or pumped to develop the well and determine the yield. The quantity of water (yield test) is usually measured during development. The minimum test time is one hour. After proper disinfection, the well is capped to provide sanitary protection until it is hooked into the customer’s system. Well caps require an air vent. The purpose of the vent is to equalize the air pressure between the inside of the casing and the atmosphere, and to release unpleasant or explosive lighter-than-air gases. Copyright © Cyclone Well Drilling. All rights reserved. Web Design by ART2IMAGE.